It has been through all my adolescence days that I have heard this exceptionally celebrated saying “Jaan bachi to lakhon paaye, laut ke buddhu ghar ko aaye”. You should ponder what has been the reason that I all of a sudden began discussing my past times and learning restrained. Recently, I read this news that Ananth Narayanan, Myntra’s Chief, reported the decision to return to desktop version and it was made because of customers requesting to have this choice and this took me to quote this platitude here. It seems like the cat is finally out of the bag as Myntra, the first Fashion & Apparel site reported to go app-only one year back, has now taken a U-turn as its verdict has fizzled. It is totally fine that they understood their ineptitude and before losing maximum of business prospects, are returning home. In any case, not to take too much stress Myntra as we additionally have this precept that it’s better late than never and we somehow can envision from brands like Myntra that they are not going to rehash this error until the end of time. Empowered by the development of Mobile Internet in India, Myntra shut down its mobile and desktop variants and went totally app-only. Voluntarily expelling the chance for individuals to have a decent multi-device experience, it completely disowned its foremost business model. Details say that right around 35% of their client base was web inclined and Myntra abandon it, forcing them to grumble up downloading the app. To keep going long a brand should satisfactorily address the issues and desires of an engaging group of customers and Myntra without a doubt underestimated its consumers. It took the decision focused on making progress in business but somewhere wasn’t seriously educated by the necessities of customers. Buyers whose inclinations got matched up with its adversary’s strengths, shifted to them as not each customer will take the additional agony to buy from you. Forced friction is never of the good kind. Myntra being a standout amongst the most trusted E-trade destinations had majority of buyers used to order from it. But as it appeared to be a lot of bother to download the app and then, use the platform for buying, customers were compelled to leave their familiarity. Reason being, well-thought web interfaces allow users to make a simple pursuit expediently and so, browsing on a desktop or laptop is quite easier than a mobile app. Driven by overwhelming responses of purchasers, Myntra assumed that the name only is a regarded player in E-trade industry and completely disparaged its competitors like Jabong, the second most progressive name. Not surprisingly, as Jabong was attempting to accomplish customers, Myntra’s inadequacy gave it mind blowing game plans. Purchasers, who didn’t find comfort in getting on little versatile screens, went to Jabong like names. So, it didn’t go well Myntra that you ignored the statute of huge business that one should not ever think little of its rivals. Myntra shared this conviction that whopping 95% of their traffic comes from mobile and the conspicuous thing to do was to go mobile-first. Even if this information is adept, it just bodes well to put your best foot forward for mobile and design entirely, for this brand rather than simply adapting web applications to fit a small mobile screen. It didn’t try to build mobile-first experiences and went mobile-only, being over confident. The brand appeared presumptuous and somehow overlooked that one should major twice, cut once. 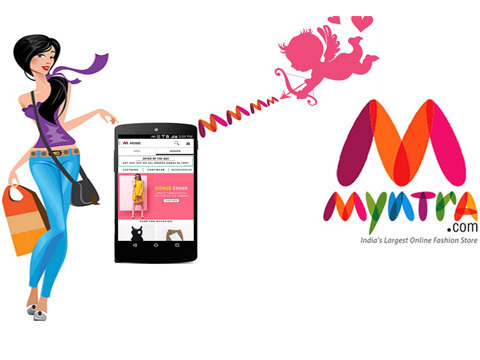 Myntra became too eager to go app only after measuring that the shift to mobile usage was increasing gradually. But as said, one should not count his chickens before they hatch, it appeared not to be a smart thought to roll out its primitive business model entirely, in view of expectations and changing market trend. Deep connection and search over mobile apps is a little nascent and as the web is not dying completely, its app-only move agitated the users and made them go through bad user experiences. Myntra tried to save a ton of dough by going app-only, counting customer acquisitions and retention (Adwords, Affiliates, Web-banners and so on), but sliced deals drawn by existing desktop consumers. This didn’t appear to be profitable to extend net income, bringing on a decline in its deals and prominence. Perhaps Myntra jumped off a cliff without first checking how far the ground is underneath or what there is to arrive on. In short, the name rushed into things before ensuring what is going to happen next. The decision of Myntra needing more control coming from users restricted on a mobile app and not giving them a decision about it, put on a show of being insensitive and based on users’ response, it had to make a comeback as a better desktop version of itself.